I've been knocking out quite a few layouts lately, thanks to my nice new replacement monitor's arrival. It's so much easier once you're not struggling with a 16-bit color remote connection! 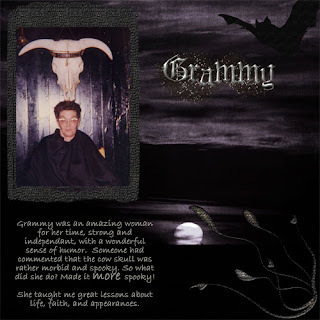 This one's about my Grammy. Not my actual grandmother by blood, but she took the role with pleasure, and was the best Grammy a kid could want. Some day I'll have to post more about her. 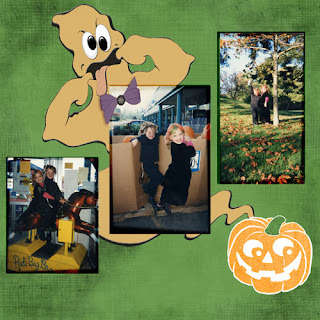 This is my daughter Bethia and her friend, clowning around just before Halloween back 9 or 10 years ago. 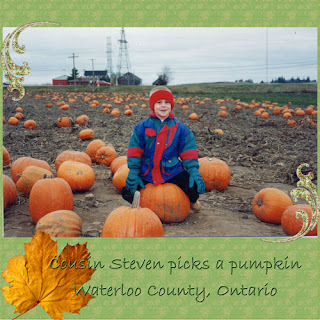 My nephew Steven, roughly the same time period. All these were done with the SAS September mega kit, which you can get for a great price right here. I have more to post, but I'm getting the hairy eyeball from my sweetie, so I'd better shut down for tonight and continue this tomorrow.